Marriage is considered as one of the biggest milestones in a person's life in our country, especially in the life of a woman. The idea of having a fairy-tale wedding at a dream venue, with the most flattering jewelry and gorgeous finery has been exploited to death by most film and Ad-makers, not to mention the subtle and not-so subtle diet of a beautiful princess marrying the handsome prince most of us are fed upon since childhood. All this naturally puts in a certain amount of expectation-depending on our personality-we have from our wedding day. We certainly want to look and feel our best and cannot imagine a bad hair day or bad-skin day. That would be nothing less than a catastrophe. I thought so too. But, let me share with you my story. I had about 6 months of time between my engagement and wedding and, but of course, I started on a disciplined regime of looking after my skin. Well-meaning advice and tips began to pour in and I carefully sifted through it all and followed a routine that seemed right. I never had a great skin so to speak. I had suffered and recovered from acne bouts, pigmentation and skin allergies a couple of years ago and hence was all the more determined to keep all of this at bay. Yet, despite my best intentions, much to my horror, I had the worst kind of acne break-out just a month before my wedding. I rushed to my dermatologist even as I knew that any kind of medication (internal or external) will take at least 3-6 months to show any visible effect. I was aghast and heart-broken, to the extent that I had an episode of black-out due to sheer exhaustion and stress! I hated to look at myself in the mirror. I'd pour my heart out to my then fiance (we stayed in different cities) and fearfully prepared him for the 'disaster' he was about to meet on our wedding day. He never understood the fuss and kept assuring and re-assuring me that he won't be disappointed or shocked to see me, and how I looked on our wedding day really did not matter to him. Of course, I couldn't be convinced and assumed that he was saying these things only to mollify me. I prayed for miracles and applied all sorts of application that promised an acne-free skin within a week and such-like. Of course, no miracles happened. The medication I was on worked slowly and it didn't really make much of a difference outwardly. I put up with all the stares and sympathetic questions and advises from people around. But, my family and the one person who was to matter to me the most in my next phase of life, stood rock solid behind me. I'll never forget one thing that my sister told me, "Wedding is just a day's affair. Marriage and it's dynamics begin only after that. Do not stress so much on that one day that you miss the fragrance of the days that are to follow." I guess the look says it all! Indeed, I found a great friend in my husband who supported and loved me unconditionally ( and continues to do so) from day one, pimples and all. I learned that it did not matter how you meet your spouse, how you get married, how you looked on your wedding day, how many compliments you got, or how happy the guests were. The real test is how both the spouses handle their share of joys and sorrows, how they approach their differences and how much of inner cleansing they undertake to make their bonding free from ugly marks of distrust and misunderstandings. So, my dear brides-to-be, take care of your looks but do not become obsessed with polishing the outer self so much that you fail to prepare your mind and soul for an enriching journey. Take care, because you are worth it! This post is a part of #GarnierPureActive activity at Indiblogger. and because this post also defines a woman for who she is from within and not on the basis of how she looks, I also link it to the #UseYourAnd activity at BlogAdda in association with Gillette Venus. The wedding pic is simply adorable! And the smile on your face says it all :) Great post, Uma. How wonderfully you have written Uma! And the picture is just perfect. Yes, that pic says it all! I realized it on my wedding day that all the pressure is just futile. The moment you see your groom on that day, everything else blurs into a haze. Gayatri, there is certainly a stereotype that needs to break..that futile perfection that all of us seek to achieve..so not worth it! I love the energy and love in this post, Uma. How beautifully you have expressed it. That smile on his face and yours say the whole story. Appearances, you can take a hike. Real beauty is here to stay! Well written Uma! And it's a lovely pic from your wedding! So true Uma! For me the disaster happened during my engagement, the perpetrators being the beauticians. 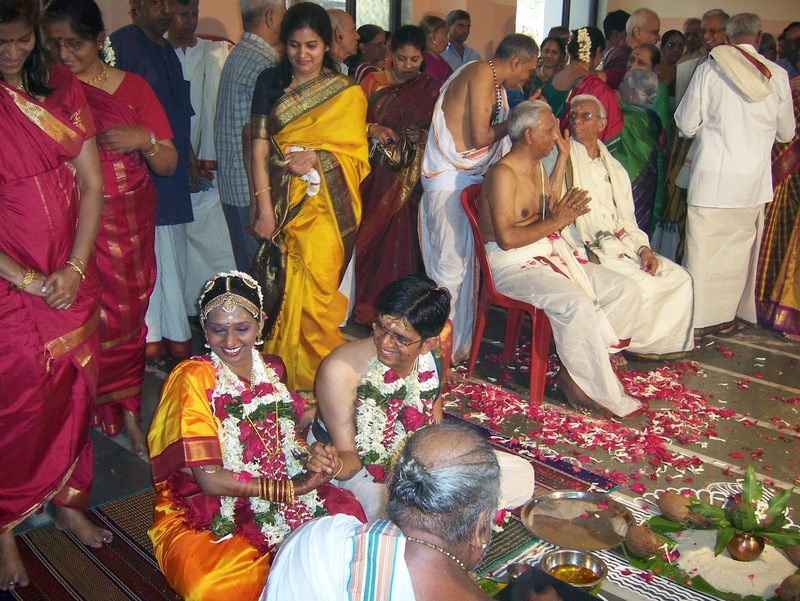 Engagement happened in Madurai and I made sure to hire services from a branded parlour. At the end of the make up session, I was looking like a ghost with all the concealer they used under my eyes. Everyone said my original self would have looked much nicer rather than this ghoulish make up. And I was terribly upset but let it pass nevertheless (I dint have a choice anyway). An honest post not just written for the contest. We must not give so much importance to our looks that we end up getting depressed. You look so lovely! you have no clue! We all tend to do that, Uma. At that time, at that age, that is what we feel important. How good we look on the day of wedding. And pimples, I know how it makes a person feel. But despite all odds, you look happy and above that you are happy now...that is all that matters...isn't it? Good luck for the contest. True, Latha. We want to look our best on our special, absolutely nothing wrong with that. Thankfully, pimples did not come in the way of the happiness, yes :-) Thank you, Latha! but yes none of them really matter.... 5 yrs later here I am with no make up, matted hair, bitten nails, always too tired to change out of my house clothes.... and my husband loves me probably more than on our wedding day...and I love him back for loving the drab me! My kid is happy and healthy... the best make up I have ever put on is now! oops, dealing with the aftermath of Jaundince on your wedding day sounds bad! Very rarely have I seen brides looking simple and natural. The beauticians and hairdressers make a killing by over-charging the bride but leave them looking like ghosts. Uma your charming smile is the most glittering ornament on your wedding day. Oh, the beauticians can be a nightmare, Kalpana..but in my case she was quite the saviour since she managed to cleverly camouflage a lot of damage. that's very well said. We fuss so much about bridal make up and stuff, and spend even more on that... but at the end all that matters is the person next to you, ready to spend the rest of their life with you.